It turns out a broken ankle really cramps my style. Despite that, I managed to get out into the prairie a few times this week. While I’m pretty slow, spring is progressing at lightning speed. Green grass is spurting up through last year’s thatch, flowers are erupting here and there, and most grassland breeding birds have returned, filling the air with song. I paused a few minutes to watch some mound building ants this week, and their frenetic activity matched the crazy speed of the prairie all around them, as both plants and animals seem to be rushing to make up for lost time after an extra long winter. Last night, a big spring thunderstorm passed through, bringing much needed moisture, and adding even more wild energy to the landscape. Here are a few photos I managed to get this week. If you haven’t already, get out and visit a prairie near you. Things are HAPPENING!! A very active colony of mound building ants in recently burned prairie. Ants rapidly coming and going from of many tunnel openings into the colony. Rain drops on spiderwort leaves in my backyard prairie garden this morning. Last week, I found ant species #23. Formica obscuriventris – aka ant species #23. It’s a mound-building ant of prairies and savannas. If you’ve followed this blog for a while, you know that we’re trying to inventory the ant and bee species (and others) in our Platte River Prairies. Our main purpose is to see whether or not our restored prairies are providing habitat for the insect species living in our remnant prairies. 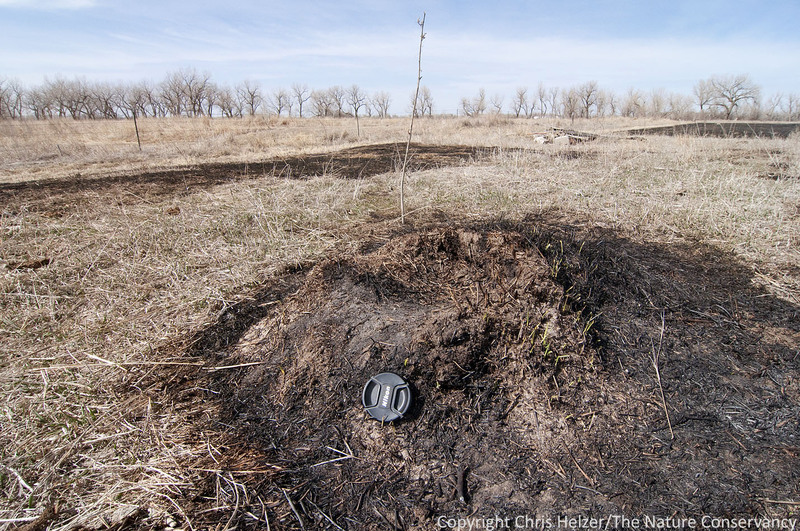 If they are, it’s likely that we’re succeeding in our attempt to use restoration to enlarge and reconnect fragmented prairies. Last fall, I posted the results of the brief survey James Trager helped us with in the summer of 2012. At that point, we’d found 22 species. During a prescribed fire last week, we found a big ant mound. The ants were understandably agitated by the fire… I noted the location of the mound and went back the next day with my camera (and my new flash kit!) to get some photos. 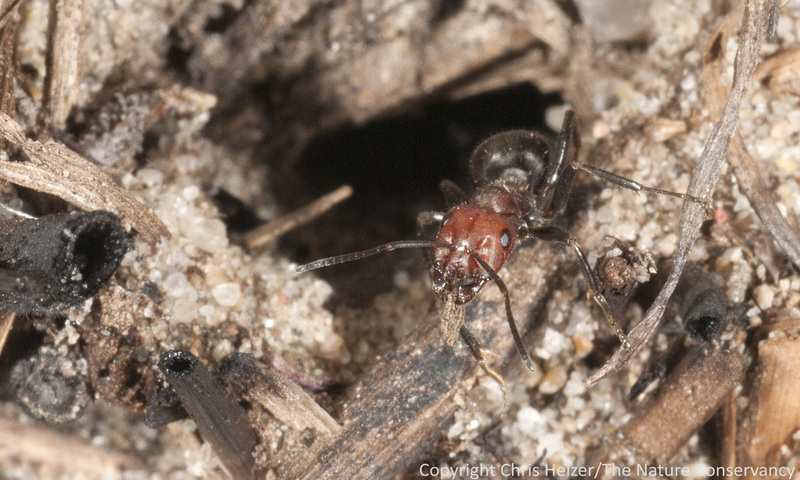 I emailed James the photos to see if he could identify the ant species, and of course he could – Formica obscuriventris. More importantly, it wasn’t a species we’d found last summer, so I could add it to our list! The ant mound had multiple entrance holes. There was a lot of activity around this particular one. The mound was in a restored prairie, which was good to see. Of the 23 species we’ve found so far now, 4 of them are tree-dwellers and 19 are prairie ants. Of the 19 prairie ant species, we have found 14 in restored prairie. I’m hoping we just haven’t looked hard enough to find the other 5 in restored prairie (very possible, given our limited sampling effort so far). If that turns out to be true, it would be a great indication that our restored prairies are acting as new habitat for those ants, and enlarging/reconnecting formerly fragmented prairies. Ants carrying the carcass of one of their compatriots. Here’s the mound, with a 72mm lens cap for scale. For those of you interested in the photography side of this, I photographed the ants with a 105mm Nikon macro lens on a Nikon D300s camera. The images above are variously cropped to show the ants better. It was a partly cloudy day, and the light kept switching from dark cloudy to bright sunny – neither of which was great for photography. To mitigate that, I used a diffuser (thin white cloth on a big collapsable plastic circle about 2 ft in diameter) to reduce the light when the sun popped out and then used flash to fill in the rest of the light needed to use a fast shutter speed. My flash kit is a Nikon R1 Close-up Speedlight system, which has two small flashes – mounted on either side of the lens. …I might start to like this whole flash photography thing.